Help, Mr. Wizard! 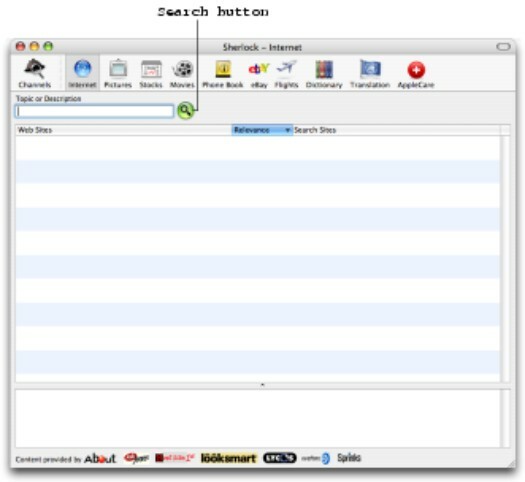 : Sherlock simplifies the major search engines and allows you to access them all from a single location — no longer do you have to open your Web browser and laboriously visit search engine sites like Lycos. If you find something on a Web site that you want to explore, a simple double-click of the item automatically launches your Web browser and displays that page. Real-time, really: You can also display real-time information by using Sherlock: Access stock prices, news and headlines, your eBay auctions, and such. Plug it in: Sherlock can provide additional services through the use of plug-ins — software add-ons offered by companies, libraries, and Apple itself that expand the functionality of Sherlock. Show me: Depending on the type of information you’re seeking, Sherlock can display text, graphics, and even video. Clicking its icon on the Dock, which features Holmes’ hat and magnifying glass. Opening the Applications folder on your hard drive and double-clicking the Sherlock icon. Figure 1: Start the hunt here from the Sherlock main window. Use the Channel buttons displayed along the top of the window to quickly switch between different types of searches. To display all the channels on a single page — complete with descriptions — click the Channels button on the toolbar. In the Topic or Description box, type whatever you’re searching for. The fields in this area can change depending on the type of search that you’re conducting. The fruits of your search appear in the results section — for more information on an item, double-click it. Clicking an item once often displays a quick summary of the information in the summary section. Several channels alter the basic look of the Sherlock window, so not every channel will offer all these controls. Note the handles — the double lines — that appear in the separator bars. You can click and drag these handles to resize the dimensions of the channel button display and the results section. To sort a column in Sherlock, just click the column’s heading button. For example, if you’re looking at your stock portfolio, click the Name column heading to sort the sites in ascending order. Click again to sort in descending order (so that the triangle at the corner of the column header points down). You can also click and drag the right edge of each column’s heading button to resize the width of the column.